Should Wisdom Teeth Be Removed Before Orthodontic Treatment? •	The current teeth are already blocking the mouth before the wisdom teeth have erupted. •	The teeth are developing in such a way that they will exert pressure on other teeth. •	The teeth are causing discomfort, only grow in part way, or become infected. •	The back molars cannot be effectively cleaned, especially with braces in place, which can lead to bacteria formation and infection. 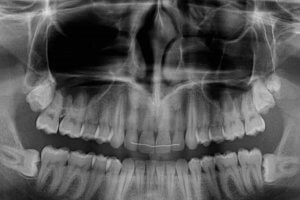 Prior to removing asymptomatic wisdom teeth, we will preform an examination and take x-rays to determine the status of wisdom teeth. As braces are a sizable investment, it makes good sense to remove troublesome teeth before proceeding with the braces. This does not hold true if the teeth are causing no problems. Only a thorough evaluation by an experienced professional can determine whether removing back molar teeth that are causing no problem is worth the expense or not.